Wynne WN6-3241 square tables provides group sitting options with bench seating. Square tables are offered with a number of seating options and can be surface-mount, embed-mount or freestanding. Choose 36in or 48in length; two, three, or four seats, surface-mount or embed -mount or freestanding, umbrella or none; Powder-Coat or Duracoat finish; and color. 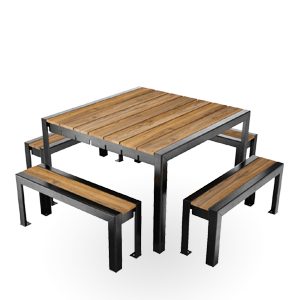 Wynne tables have a steel recycled material content of 99% of which 87% is post consumer content. This content may vary based on the product design, product material type, and interchangeable piece parts. All styles are 100% recyclable. For more information about SiteScapes sustainable products and policies, please refer to our Environmental Statement. Powder coat: Powder coat products are warranted against defects in material or workmanship for a period of one year. For warranty to be valid, claims must be accompanied by the proper written maintenance record. DuraCoat: DuraCoat products are warranted against defects in material or workmanship for a period of five years. Stainless Steel/Galvanized: Stainless steel and galvanized products are warranted against defects in material or workmanship for a period of five years. 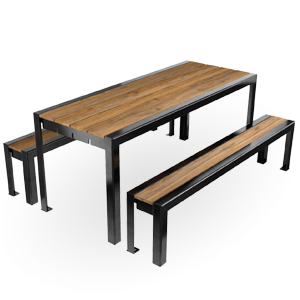 Limited twenty year warranty against structural failure of steel bench frames or steel bench assemblies, table frames, trash receptacle frames, and planter frames. Limited 10 year breakage warranty on all ductile cast iron bench ends and components. Limited 5 year warranty against structural failure of any aluminum assemblies, frames or components. Limited three year warranty against structural failure of all bicycle racks. Limited ten year warranty against any structural failure of recycled plastic components. Limited five year warranty against any structural failure of Ipe and Western Red Cedar wood components. Limited 3 year warranty on all swivel devices. Limited one year warranty on any products not specified above. All warranties commence on the date of invoice issued from SiteScapes, Inc. Should any failure occur within the warranty period, SiteScapes, Inc., upon written notification shall repair, replace or refund the purchase price of products determined in SiteScapes, Inc. reasonable judgment to be defective in workmanship or materials. SiteScapes, Inc. liability and the buyer’s remedy under these warranties are limited to the repair, replacement or refund of the purchase price, at SiteScapes option, of products determined in SiteScapes reasonable judgment to be defective in workmanship or materials. SiteScapes will not be held responsible for the costs incurred in labor to remove, install, or replace the alleged defective product. SiteScapes warranties do not cover any defects or failures resulting from vandalism, negligence, accidents, abuse, lack of maintenance, or improper use or installation. In addition, SiteScapes will not cover any defects or failure due to product that has been tampered with or altered, modified or repaired by anyone not previously approved by SiteScapes. In addition, SiteScapes will not be held liable for ANY damage or injury as a result of product not that is not permanently anchored in place or not anchored properly.